The Presidency Council (PC) has agreed to give Sirte municipal council LD 4.5 million to help with hygiene and sanitation and the maintenance of some facilities in the town. It is also to go towards support for the municipal guard and for families who lost their homes in the fight to oust the so-called Islamic State last year. The money comes in response to the demands for funding for the town’s most pressing problems made by Sirte mayor Mukhtar Al-Madani at a meeting with PC head Faiez Serraj three weeks ago in Tripoli. The amount, however, is a drop in the bucket compared to the town’s overall needs. Five years ago, long before the takeover by the so-called Islamic State and then the battle to liberate it, it was estimated that that 8,000 homes had to be rebuilt as a result of the massive destruction during the revolution. The cost then was estimated at half a billon dinars. It is now far more. There has been some other small-scale movement in recent day. UNICEF representatives were in Sirte today to follow up on projects they have put in place. They urged municipal figures to construct a database that contains the details of families affected by housing issues. Yesterday, UNICEF delivered the first of 30 prefabricated classrooms given by Germany to be set up in the town. Placed at the town’s busiest schools, they will provide teaching space for some 1,000 students. The huge accumulation of rubbish and the inability to clear it also remains an issue in Sirte. In response, the municipality has begun the process of cleaning up the streets and moving trash to the main landfill area, seven kilometres west of the town. To help with this, the UNDP delivered a new garbage truck earlier this week, following a request from Madani. 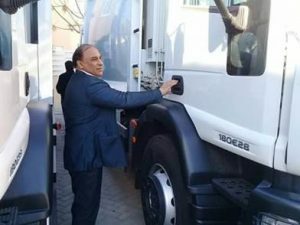 The truck is part of the Libya Stabilization Facility’s $7.6-million budget for the town, run by UNDP, and which has already resulted the delivery five ambulances, the rehabilitation of Al Fateh school and ongoing work at three other schools. Work is also due to start on refurbishment of the local polyclinic. Madani is meanwhile constantly busy trying to find funding for other projects and overseeing efforts of Sirte’s reconstruction. Yesterday, he was in Tripoli for a meeting with Yousef Abshir, the head of ODAC (Organisation for the Development of Administrative Centres) to discuss the return of companies involved in constructing 10,000 housing units, reconstruction at the University of Sirte, and the expansion of the Ibn Sina hospital.